Founded at the end of the whisky boom in 1898, it was built and designed by the notable distillery architect Charles Doig of Elgin. Today, as the summer house-martins swoop among the worm tubs at the distillery on the edge of the Royal Burgh of Elgin, little seems to have changed in over a hundred years. As many as a hundred malt whisky distilleries have been born in the green glens of Speyside. Many of them, like Glen Elgin, were built in the boom years just before 1900. But even as the new chimney stacks rose, trouble was brewing in the whisky industry. Glen Elgin’s designer, the renowned Elgin architect Charles Doig, made the prediction, that this would be the last distillery built on Speyside for fifty years. Even this turned out to be conservative; it was actually 60 years before Tormore became the next. At least, in Glen Elgin, the best was saved for last. And, in fact, little has changed in a hundred years.In the 1930s, it became part of Scottish Malt Distillers, for whom it was an important component of the well-known White Horse blend. Innovations were rare during Glen Elgin’s first half century though one was crucial – the site had partly been chosen for its ability to make use of abundant water supplies from the Glen Burn to drive a turbine that provided most of the power needed to run the machinery. As a result, electricity from the national supply was not needed until 1950. The early 1960s brought much needed investment and four new stills were finally added to the original two. Glen Elgin became available as a single malt and exports of a 12 year old expression, predominantly to Italy and Japan, began in 1977. As a Speyside malt, its style, of course, is smooth, mellow and sweetly honeyed. Soft spring water comes from the area of Millbuies Loch to the south-east of the distillery. Close your eyes as you nose a glass and you can almost see bees pollinating flowers, then honey- sweet and malty flavours dominate the palate – even a dash of tangerine fruitiness can be found. Tangerine fruitiness is the hand-crafted Glen Elgin’s “signature”, born of long and precise fermentation. An easily accessible single malt with Speyside fruit and sweetness. Sweet. Almonds, or maybe marzipan? Some orange juice. Perhaps a trace of sawn wood. With water, Speyside esters, nut oil and buttery fat, prawn crackers, traces of fresh pears; a whiff of smoke or steam; dense. Pleasant mouthfeel; sweetish, then dryish, with some acidity between; all well balanced. 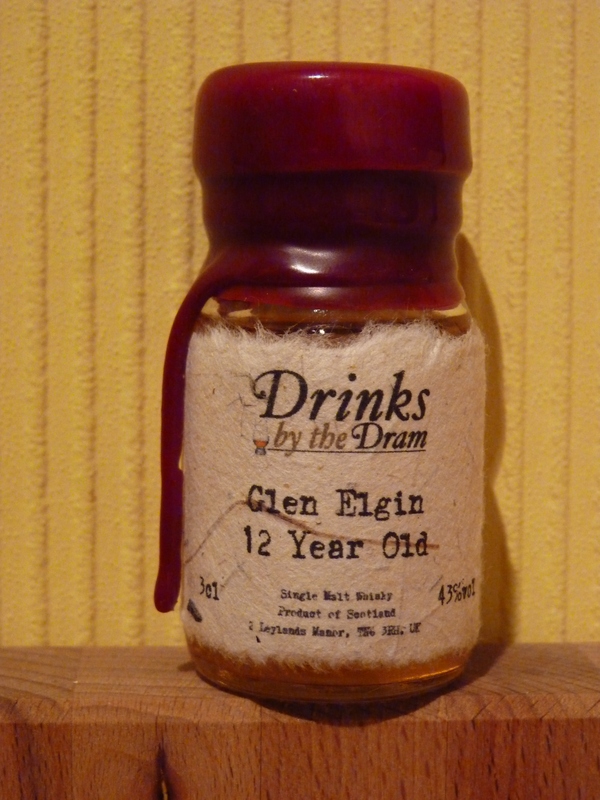 I purchased a 3cl sample of this Glen Elgin 12 Years Old from Master of Malt for £4 to try out one of the lesser known distilleries under Diageo’s umbrella and continue my tasting tour of Speyside malts. Fruity and floral, yeast and barley come through with a damp mustiness and a little earthen copper. There is a certain fustiness to the odour that smells like something old and damp. More like tangerine skin & zest. Probably not, this isn’t really to my taste. This is a shame as I love tiramisu and the thought of a creamy cocoa and coffee bitterness seems appealing at first, but sadly didn’t translate for me due to the fruitiness going on. For about the same price or a little more there appears to be some independent bottlings e.g. Connoisseurs Choice (Gordon & MacPhail) or Dimensions (Duncan Taylor) that may be worth trying. This appears to be one of those whiskies that becomes quite classy, complex and interesting with age, if any of the other tasting notes for older expressions are anything to go by. Perhaps next time I will splash out on a sample of an older expression, until then there are many many more Speyside distilleries to sample.